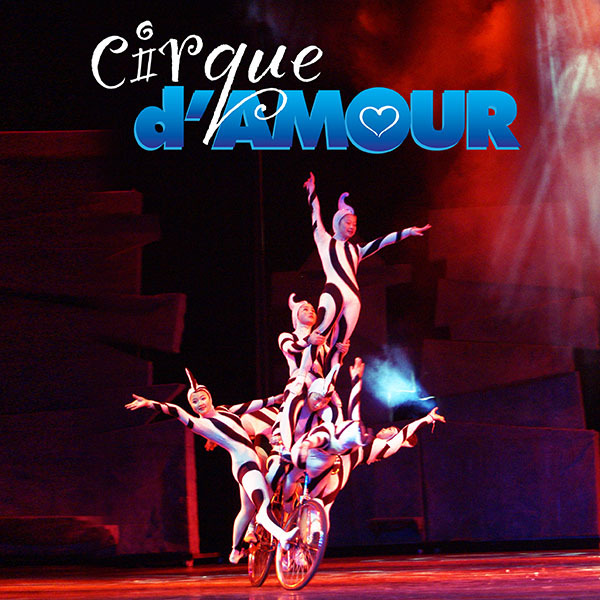 CIRQUE D’AMOUR | Love Productions Inc.
Cirque d’Amour features the Zunyi (pronounced: “dzoon’y”) Acrobatic Troupe. Known for their skills in the 2,000-year-old-art of Chinese acrobatics, the Zunyi artists are widely regarded as one of the foremost groups of their kind in the world. For almost 50 years, six generations of artists have created programs rooted in ancient characteristics that have won more than 70 prizes in domestic and overseas competitions. Cirque d’Amour has been invited to appear in over fifty countries in Asia Pacific, Africa, Europe and North America and continue to receive invitations from around the world, enthralling children of all ages with a breathtaking display of hand balancing and contortionism. Twelve female troupe members make their entrance into the arena poised on a platform adorned with paintings of elegant Asian elephants, heralding the geographical theme of the show, which is enhanced by exotic coloring, expressive lighting and ethereal music and dance. The six male artists appear throughout the show, framing the opening tricks of the teeterboard act, as well as darting to and fro in a dizzying display of gyrating German wheels. All 18 members of the group have been selected to pursue their specific skills, honed to perfection while living at and attending the Troupe’s school in Zunyi – an opportunity considered by the performers, their parents and their community as a great honor. Combining superb acrobatic and gymnastic skills with rich cultural practices, troupe members use apparatuses symbolic of historic, everyday household implements reflecting the origins of their amazing art to execute their stunning stunts. Constantly in motion, the artists give the impression of an endlessly shifting shape that conveys life to an intricate trellis, a cascading fountain and one after another striking sculptural forms – each seemingly impossibly achieved by human forms.